Tonight Celine Haga choked her opponent unconscious at Invicta 21 as her bout came to an end but instead of being declared the winner the matter went to the judges who handed her opponent a victory. The bout took place in Kansas City and was regulated by Missouri’s Office of Athletics. This is an unusual event and does not appear to be clearly defined in the applicable regulations. In other words the Regulations don’t expressly say “when a figther is unconscious before the bell due to a legal submission they will be declared the loser of the bout“. It is a result which should be self evident. 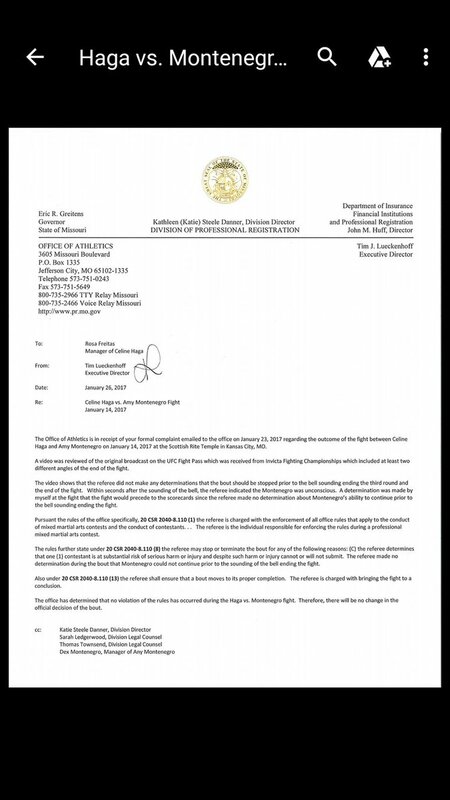 As was learned from the Tonya Evinger controversy, Missouri does have appellate rights for fighters but these are limited in scope. Any party may contest the outcome of any bout within ten (10) days of the decision by writing all the facts and the basis for the complaint. The complaint must be forwarded to the office. If there appears to be a violation of these rules, the director or his/her designate shall investigate, and, if the claims seem to be substantial, hold a hearing and issue its findings and decision. The next question is when can the commission overturn the result of a bout on appeal? This is where things become a little murkier. Clearly they can change the ‘outcome of a bout‘ but are silent on the circumstances when they can do so. All the appellate rules reference is needing a “violation of these rules“. The only one of these that can be of value to Haga is #3 but without pointing to a Rule that the referee should have declared a different result a conventional appeal may lack the needed framework. If the Inspector is unwilling to do so Haga can scour the rules pointing to anything supporting her argument in a formal appeal. One rule Haga can point to is 20 CSR 2040-8.110 which states a referee may “stop or terminate a bout” where “The referee determines that one (1) of the contestants is at substantial risk of serious harm or injury and despite such harm or injury cannot or will not submit“. This language would clearly apply to a situation where a fighter is choked unconscious. Missouri’s MMA regulations contain a hodge-podge of obscure rules such as requiring timekeepers to keep a “knockdown count” which applies when a fighter is “unable to defend herself” and further that a fighter cannot be saved by the bell in such a situation. Instead if a fighter is unable to defend herself “within ten seconds of the end of the round,, the timekeeper shall not ring the bell until the referee indicates the contestant is ready“. Overturning bout results is notoriously difficult but whatever route it takes to get there, hopefully this result will be overturned. The problems with some of this is the language that the referee “may” and doesn’t it seem like the rules state that you need to appeal to the inspector at the event? Thanks for your comment CJ. You are correct that the section addressing referee duties is phrased permissively making it difficult to argue that there was a rule violation. That is why the stronger argument is simply to point out the vacuum of applicable rules and hope the Inspector exercises his powers to remedy this. physician to aid the stricken contestant. That the referee did not immediately summon the physician but instead allowed the fight to end.